Thief of Thieves is an interesting book before you even get around to reading it. This is a comic where Robert Kirkman channels his TV writer’s room experience and acts like a showrunner. The credits read Robert Kirkman – Story, Nick Spencer – Writer. The copyright reads “Robert Kirkman, LLC.” That copyright is all the more interesting considering “I Quit.” is pretty clearly a TV pilot if you read it as a graphic novel and not a monthly serial. Since AMC optioned Thief of Thieves for development as a series, we might get to see how faithful the first episode is to the book, too. “I Quit” is the story a thief who’d like to quit. His professional name is “Redmond” and the FBI is hot on his trail. He’d like to get out while they still aren’t quite caught up to him and perhaps get back together with his broken family. There’s just one little problem. His son is trying to follow in his footsteps, but isn’t really up to the challenge, so daddy has to bail him out… and not with a bail bondsman. When you talk about crime comics, most people will have 100 Bullets, Criminal, Parker or perhaps Scalped pop up in their head. There’s a tonal difference. 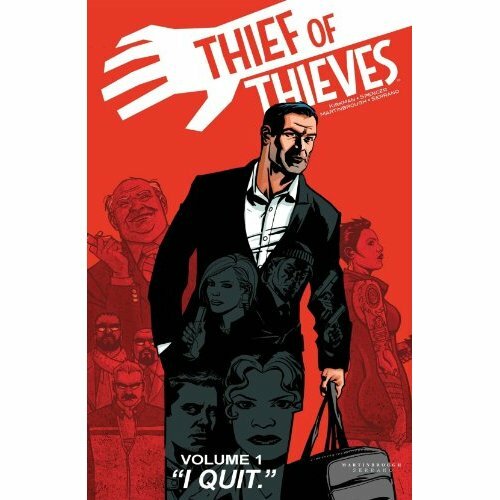 Where those series take their cues from crime novels (literally, in the case of the Parker graphic novels), Thief of Thieves is in more of the cinematic tradition. It moves along at the breezy clip of a heist movie. Ocean’s 11, particularly the recent remake series is an obvious touch point. The Italian Job (either version) would be a touch point. It’s slick and it moves quickly. While there’s more darkness and world weariness to the tale, than the cinematic influences, and there’s certainly double dealing all around (that’s the genre), but it isn’t quite crossing over into Mamet territory. I’d call this falling more on the entertainment side than literary. While the Ocean’s 11 vibe will smack you in the face, particularly when Redmond’s specialist cohorts appear, this is not an ensemble book. It’s firmly about Redmond and his attempts to extricate himself from a bad situation. The peculiar thing about this book (especially if you were reading it as a seven month serial) is that it’s an exercise in setting up a status quo. As the book ends, Redmond is set up to continue his adventures. In that respect, it’s a little like “Death of a Citizen,” the first Matt Helm novel. At the end of that novel, Helm knows what he’s going to be doing for the rest of the series. He’s not happy about it, but he knows. The art is by Shawn Martinbrough. Martinbrough is probably in the under appreciated category. I remember him for ’90s runs on The Creeper and Detective Comics. 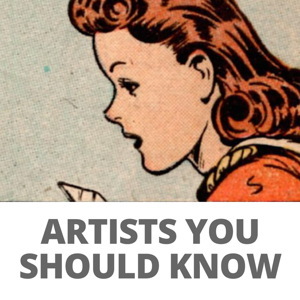 He’s roughly in the Caniff school of cartooning. Relatively realistic with just a hint of comic strip to it. Martinbrough tends to have an open style, that gets filled in with shadows for noir effect here and there, as opposed lots of speed lines. He’s a good fit for this sort of book and its nice to see him on a higher profile project. On the whole, I liked this. It’s a little different flavor/tone than most of the crime comics out there right now and even though it just screams “I made this to pitch a TV series,” it works as a comic. There is character development and the characters actually move from point A to point B. Given the whole situation with Kirkman farming out the writing and the quick development sale to AMC, I want to emphasize that while having a cinematic feel, this isn’t a case of storyboards printed up in comic format. I haven’t read any of the second arc, where Martinbrough stays on as artist, but James Asmus tags in for Nick Spencer as the writer telling Kirkman’s story (back to the TV writer’s room). I’m curious how much tonal change there will be swapping out writers and I’m curious to see if it veers into more of an ensemble character story or continues down the darker path of a man who can’t quite manage to get away from his career. Worth a look if crime/detective fare is in your wheel house, but keep in mind it’s not as gritty as some of the usual suspects in this genre. Thief of Thieves opts for slick over gritty and that’s going to be a matter of taste. Mild recommendation if you’re a Criminal fan, though it may not be harsh enough for you. Moderate recommendation if you like the Soderberg capers like Ocean’s 11 (or perhaps Out of Sight). This comics lies somewhere in between the two. This might actually be my favorite Kirkman comic at the moment. And I think the transition between writers went pretty smoothly. If you don’t think about it too much, you don’t notice it at all. Good review and I like that the elephant in the room (TV development) was addressed and considered. 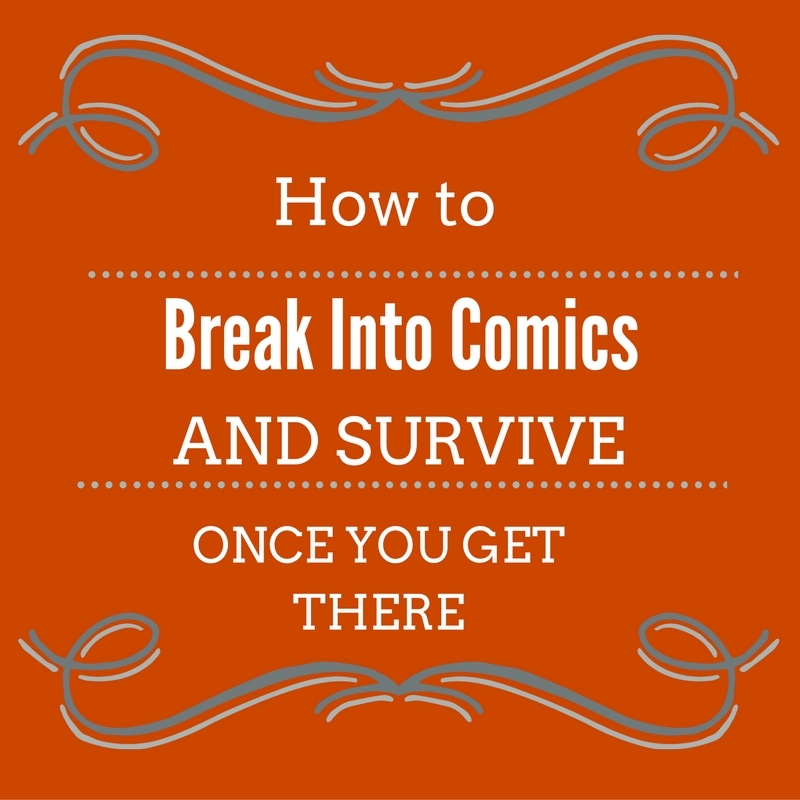 And yet… it still works as a comic — which speaks well about the work. I was unfamiliar with the artist but now I’m a fan. Nice work with a touch of the classics.